Home > Jamaica Tours > Montego Bay Tours > Catamaran Cruise Dunns River Falls from Montego Bay. Catamaran Cruise with Dunn’s River Falls offers an unforgettable experience, join us on a scenic drive along the north coast. Journey with us to the famous Dunn's River Falls in Ocho Rios. The fun begins onboard our catamaran, unwind and relax while the DJ spins the best reggae and soca music. For your entertainment pleasure our crew will teach you the latest dance moves and keep the party popping. Sip a glass of fruit punch or soft drinks while our captain explains the safety rules on you Catamaran cruise. The fun begins with snorkeling on the beautiful deep blue, after cruise past emerald hills, waterfalls, and historical sites. Enjoy the music while the DJ pumps up the volume while you enjoy our open bar before docking. 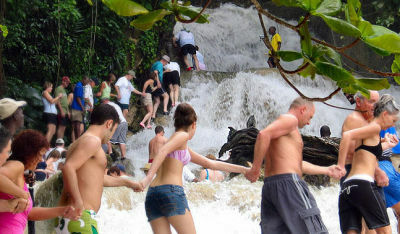 After docking at the foot of the famous Dunn’s River Falls our guides will then lead you on your climb. Now the challence begins to climb the 600-foot cascading waterfalls. After your Catamaran Cruise with Dunn’s River Tour experience, cool down on your cruise back to the dock. We guarantee this is an experience you would not want to miss, both Dunn’s River Falls and Catamaran cruise is the most visited attractions in Jamaica. Days Available: Mon. – Sat. Booking your Catamaran Cruise with Dunn's River Falls Tour is one of the most exciting excursion combination in Jamaica. Both attractions are reated #1 and the most visited excursion on the island. Dunn’s River Falls & Park is one of Jamaica’s national treasures. Globally, it is as well known as reggae and equally stimulating.There are few places where the Arawak name "Xayamaca" - land of rivers and springs - is more apt. The Spaniards called the area "Las Chorreras", the waterfalls or springs and it is truly one of the most beautiful spots on the island. A stone's throw from Ocho Rios, one of Jamaica's fastest growing resort centres, Dunn's River Falls is unique. Described as a living and growing phenomenon, it continuously regenerates itself from deposits of travertine rock. The result of precipitation of calcium carbonate from the river, as it flows over the falls. The small dome-shaped cataracts are usually associated with thermal spring activity found in limestone caves. This, combined with its location near to the sea, gives Dunn's River the distinction of being the only one of its kind in the Caribbean, if not the world. We had an amazing time, the cruise was exceptional, the snorkeling was fun and the crew was just perfect. The falls was another adventure, we climbed twice, this was a wonderful experience that we will cherish. Ask a question about the Catamaran Cruise Dunns River Falls from Montego Bay.